World War One resulted in the horrific slaughter of millions of workers who were initially encouraged and then conscripted into the bloody horrors of trench warfare. Women too were cajoled to do their bit for ’the war to end all wars’ by replacing the men sent to the front in factories and workplaces across Britain. But in this anniversary year there is likely to be scant attention given to the militant struggles of working class women during those four years of brutal conflict, where class divisions remained a feature of everyday life. Historians often refer to how World War One transformed the lives of and attitudes towards women, and claim that women were rewarded for their wartime sacrifices with the extension of the right to vote at the end of hostilities. The reality though was very different as working class women, abandoned by the national leaders of the tradeunions and suffrage movement, fought their own battles for equal pay and women’s rights. It is true that during the war hundreds of thousands of women found themselves engaged in jobs which had previously been the preserve of men. But while the old notions of male and female work were to an extent challenged, albeit temporarily, pay remained unequal. The post-war extension of the franchise was also not applied equally. All men over the age of 21 were given the vote, while for women it was limited to those who were householders and over the age of 30, excluding many working class women. Many portrayals of women during the war tend to focus on the volunteers of the Voluntary Aid Detachment (VAD), such as in the recent BBC1 drama series ’The Crimson Field’, and the Women’s Land Army (WLA), which by 1918 had 20,000 members. But for the first time women also took up posts on the railways, buses and trams, and in the post office, banking, retail, and the civil service. Women became window cleaners, chimney sweeps, coal deliverers, street sweepers, electricians and firefighters. The flood of women into the munitions factories also caught the imagination of commentators. Paintings depicting women factory workers by female artists such Anna Airy and Flora Lion attest to the profound cultural changes of the times. The common impression that women were absent from the workplace prior to the war is mistaken: About four million women, a quarter of the female population, were employed outside the home. The beginning of the war actually initially resulted in a dramatic decline in female employment, traditional industries employing women such as dressmaking virtually collapsed as richer women bought fewer luxury goods. The cotton industry was also affected by the closure of the North Sea to shipping. By September 1914 nearly half of women were unemployed. The war did eventually result in one and a half million women joining the workforce for the first time. This was facilitated by the provision of nurseries, a progressive measure which was reversed at the end of the war as the political establishment sought to drag women back into their traditional pre-war roles. The incorporation of women into the workforce was not achieved without resentment and some resistance from many members of the craft unions, with most male professions remaining closed to women throughout the war. But the divisions in society were not restricted to gender. The types of jobs women went into were greatly influenced by their social class. The WLA consisted of mainly upper and middle class women. Working class women were deemed unsuitable on the grounds that they lacked the ’high moral fibre’ necessary for farm life. It was also upper and middle class women who enlisted with VAD. Many sacrificed their lives working as nurses on the front line, but a large number did morning stints at local hospitals while domestic servants cleaned their homes. In contrast, working class women worked during the war out of necessity. However, for many, the war did change the nature of their work, giving them an opportunity to escape grossly exploitative jobs in domestic service and sweated labour. 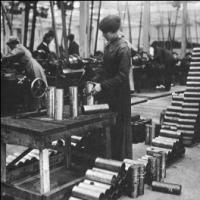 An estimated 800,000 women eventually became employed in all aspects of the munitions industry. Three quarters of these worked under the direct aegis of the Ministry of Munitions, in effect state control and national planning of munitions manufacturers following the failures of private industry early in the war. Working conditions in the munitions factories were harsh. Hours were long, and with the relaxation of health and safety regulations the conditions of work were dangerous. It had a disastrous impact on women’s health. Poisoning from the chemical TNT was common, resulting in the yellowing of the skin which earned women workers the nickname ’Canary Girls’. Yet toxic jaundice was serious. Thousands of women, and men, inhaled and ingested dust. They suffered stomach pains, giddiness, drowsiness and swelling of hands and feet. The first deaths of women workers from this insidious disease were reported in 1916, but little action was taken. Accidents also occurred from the daily handling of explosive chemicals. Hundreds of workers lost their lives in explosions, and thousands of people were made homeless. 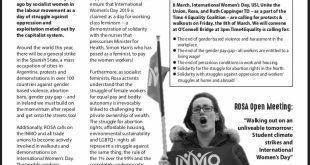 Any references to working class women in the anniversary programmes and articles this year are likely to ignore their connection to the trade union movement. The concentration of women workers in the munitions industry encouraged rapid growth in trade union membership. Overall, female membership rose by 160% during the war, particularly in the National Federation of Women Workers, and the Workers Union. By 1918 the latter employed 20 full-time women officials and had a female membership of over 80,000, a quarter of the union’s total membership. Increasing numbers of women were joining trade unionsat a time when the official machinery of the unions had effectively become incorporated into the state. The best militants, mainly socialists and Marxists, rejected the industrial truce declared by the union leaders and created new rank and file bargaining structures, which by 1917 were to result in the formation of the National Shop Stewards Movement. This process began on Clydeside where a successful pay strike by engineers in February 1915 had been organised by the Clyde Labour Withholding Committee, the forerunner of the Clyde Workers’ Committee (CWC). Nine months later, threatened with the deduction of rent arrears from wages, a strike of 15,000 Clyde shipyard workers in support of rent strikes organised by women involved in a tenants’ movement against rent increases gave further momentum to the CWC. Teams of women mobilised against sheriff officers (bailiffs) to prevent attempts at eviction. This combined community and industrial action of working class women and men forced the government to immediately implement rent restrictions on private landlords. The main issue facing the CWC was dilution, the replacement of skilled labour with unskilled labour, including women workers. During war conditions dilution was difficult to prevent. The CWC agreed not to oppose dilution on the condition that all the industries and national resources were nationalised under workers’ control, and that all workers, including women, be paid the standard rate for the job. The shop stewards committees spread, particularly to Sheffield where it was broadened to include skilled, semi-skilled and unskilled male and female workers. JT Murphy, one of the leaders of the Sheffield Workers Committee, explained how the use of women as cheap labour created antagonism between men and women. Murphy and the Sheffield shop stewards committee sought to overcome this through giving active support to the fight of unskilled workers, men and women for higher wages and encouraging women into the trade union movement. The male dominated workers’ committee condemned sexism and sought closer cooperation with unions representing women workers, particularly the Workers’ Union. The class divisions among women during the war extended to the suffrage movement as the middle class leaders abandoned their votes for women campaigns. Christabel Pankhurst fully supported the war and became involved in the ’patriotic’ movement to pressurise men to enlist in the armed forces. Many off-duty, on-leave and even wounded servicemen became the targets of this movement, as did men found unfit for military service. Many engineering workers who had trade exemption from military service took to wearing ’On War Service’ badges to protect themselves from the white feather vigilantes. Emmeline and Christabel Pankhurst called for military conscription for men and industrial conscription for women. They placed the funds of their organisation at the disposal of the government. They organised government backed demonstrations to put pressure on women to take up jobs in the factories. The reactionary nature of their patriotic politics became apparent in their support for the banning of trade unions. Christabel demanded that unskilled and semi-skilled workers be taken on without any safeguards. In opposition to her mother and sister, Sylvia Pankhurst championed the cause for equal pay for equal work and fought for better work conditions for women. Sylvia’s East London Federation of Suffragettes continued to agitate on votes for women during the war, while also campaigning for peace, civil liberties, and controls on rents and food prices against the blatant profiteering of the capitalists. They also demanded the nationalisation of food supply and the abolition of private profit. At the end of the war various women’s organisations demanded equal pay, regulation of pay in low paid trades, a 48-hour week, abolition of work fines, maternity provision, and the vote. There were also demands for all trade unions to be open to women workers, with provision for representation of women on union governing bodies. The ruling class, though, just wanted a return to ’normal business’. But with mass industrial action surpassing pre-war heights and a near insurrectionary atmosphere, the government was compelled to introduce a raft of legislation on rent control, council housing, maternity rights and child welfare. In time, with the defeat of workers’ struggles, these progressive measures would be rolled back. The attitude of the trade unions on women’s rights was not consistently progressive. In 1918 a trade union conference passed a motion calling on women to be banned from ’unsuitable’ trades and the exclusion of married women from work. Such views were encouraged by the political establishment which viewed women’s position in industry as a wartime expedient. The adoption of such motions by trade unions could be partly explained by the conditions of a post-war capitalism where millions of demobilised men discovered the harsh realities of the ’land fit for heroes’, but it also reflected the limitations of the official leadership of the labour movement who lacked the will to confront capitalism. It was left to women workers themselves to fight for better conditions and improved pay. A successful equal pay strike in the same year, the first of its kind, in London and the southeast by women tram and tube workers compelled the government to establish a special inquiry into whether the principle of wage equality between men and women should be applied to all industries. It concluded that the existing principles of wage determination should not be altered. In the midst of the carnage of World War One radical and progressive ideas had emerged on women’s rights, which reflected wartime experience including the drawing of women into the trade union movement, and the broader militancy of workers before and during the war. The best working class militants, women and men, became the leaders of the mass industrial battles against post-war austerity and attacks on workers’ conditions. Inspired by the 1917 Russian Revolution, they established the Communist Party, which at that time potentially represented the best means to advance the rights of working class women. One hundred years later we face the similar task of creating independent working class organisations to challenge the inequalities of capitalism.